Al-Anon Family Groups Australia | Remember: You are not alone and there is always hope. Do you need help to cope with the effects of someone else's drinking? Is the drinking of your partner, parent, child or friend worrying you? Did you grow up in a family affected by alcohol abuse? Alcoholism, alcohol abuse, or problem drinking affects thousands of families in Australia and worldwide. Your inquiry is confidential and anonymous. If you are concerned about someone else's drinking, we encourage you to browse our website for information about our programs. To help families and friends of alcoholics recover from the effects of living with someone whose drinking is a problem. Similarly, Alateen is our recovery program for young people. Alateen groups are sponsored by Al-Anon members. Alateen provides support for teenagers affected by the problem drinking of a parent or other family member. Our program of recovery is adapted from Alcoholics Anonymous and is based on the Twelve Steps, the Twelve Traditions, and the Twelve Concepts of Service. The only requirement for membership is that there be a problem of alcoholism in a relative or friend. Al-Anon/Alateen is not affiliated with any other organisation or outside entity. Al-Anon meetings are held in more than 115 countries, and there are around 26,000 Al-Anon and Alateen groups worldwide. There are meetings in every Australian state. To help identify if Al-Anon or Alateen could help you. Click on the image to access Podcasts intended for the newcomer. The Al-Anon & Alateen World Service Office website opens a new tab. Our publications are based on the shared experience of our membership, and their willingness to apply Al-Anon's principles to their lives. Our literature is available in approximately 30 languages. Families Facing Alcoholism - An informative publication published by Al-Anon Family Groups Australia. Available for purchase or download a digital copy here! Whether the alcoholic is still drinking or not, Al-Anon and Alateen offer hope and recovery to people affected by the alcoholism of a relative or friend. You can contact your nearest Al-Anon office or the Australian General Service Office for meeting details and other information. Almost all of us had questions before coming to our first meeting, but we all took that initial step toward recovery and decided to attend a meeting. Years later, many of us still come back because the meetings help us heal and offer hope. Please read the questions page to understand what happens at a meeting, and feel free to email us if you have any additional questions. 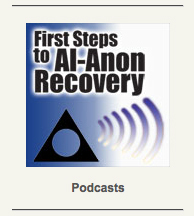 Perhaps we can help you decide if Al-Anon is for you.